Let’s visit 4 of my favorite places. We’ll take in some art, eat a yummy lunch, create our own signature (all-natural!) perfume, and then delve into a bit of early Providence history. 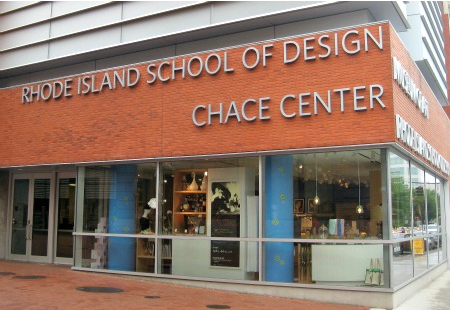 This article covers the first stop of the day, the art museum at the prestigious Rhode Island School of Design (RISD, pronounced Riz-dee). Attempting to view everything in the museum in one visit is as ridiculous as trying to see all of Europe in a week. I stop at the information desk and get a map, then go straight to the gallery I’m most interested in, where I’ll stay for at least twenty to thirty minutes. I plan on spending no more than 2-3 hours at any museum, visiting a handful of galleries or exhibits, and I get out of there at the first inkling of sensory overload. If I’m in a city that isn’t close to home, I might break for a refreshing light lunch and come back for a second run. At any museum, I’d rather view less while seeing, and appreciating, more. Get RISD museum hours and information here. Some people are intimidated by art–afraid they don’t know how to react or what to think. But there’s no quiz after this tour, and no prizes are awarded to the visitors with the most art-savvy. You don’t have to get it, like it, or impress anyone with your knowledge about it. I tell people who feel wary about visiting art museums, just look at the art and react however you want to react. 7 gallery games to boost enjoyment and protect against an infectious outbreak of intellectual hoity-toitiness. Read your friends’ minds: Silently and secretly pick your favorite work in the room, and then all try to guess what other people chose. Read the artist’s mind: Find a work that either deeply moves or totally repulses you. Tell the person next to you exactly what the artist was thinking about during creation of the piece. Speak with the authority of a know-it-all. That’s not art: When you encounter a piece you find ridiculous, put on your best Monarch-of-the-Empire sneer and whisper, “That’s not art, that’s______________ (fill in the blank with whatever comes to mind, for example: that’s what happens when a kitten bats around a ball of yarn; or that’s what you get when you clean out the wet-grass gunk that gets stuck in lawn mower’s blades). How would you do that? Imagine the tools, material and process the artist must have used. Compare ideas about how you could recreate this work. You’re the critic: Make up your own wild interpretation of the work, and tell it, in your best pretentious voice, to anyone who will listen. I feel: Name every emotion in the room: One word per work of art. Pollyanna’s glad game: Name one thing about every work in the room that pleases you — a color, a shape, an object, a line, a subject, a perspective, or if nothing else, the width of the frame. 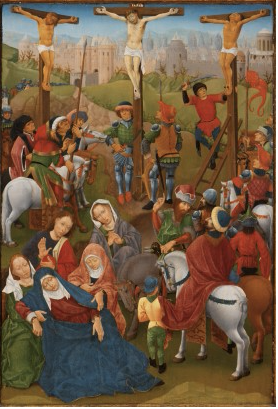 Netherlandish, The Crucifixion with Two Thieves, ca. 1450-1460, Oil on panel. The colors are simply breathtaking, the complexity is astonishing, and gazing at this, I feel as if the clever, fascinating 15th-Century artist is talking to me. What are your favorite art works or artists? The impressionists are always where we head first in any museum–even if we’ve seen them before. For a year there was a Monet “haystack” painting on loan from a private collection, hanging in the Hood Museum in New Hampshire. We lived near there at the time, and went to sit, awestruck, in front of that painting for fifteen minutes or so, every few weeks. The Impressionist gallery at the RISD is very, very nice. You’d love it, Robin. I particularly like your ideas 1 and 2 – I think it brings the work alive. Sometimes, especially with older works, it seems such a long time ago I forget that those artists probably had the same goals in mind that any of us who try to create works do. It’s art that makes me realize that humanity has felt the same basic feelings, desires, joys and sorrows, generation after generation, for a long, long time. It surprises me how little has changed. The externals change, of course–technology and fashion, but the motivations and ambitions and dreams that drive us to create, I don’t think those change much. I guess I’d never questioned it. I’d never looked behind it – to me because these artists became part of “establishment” I’ve subconsciously assumed that they painted to become part of the establishment. Which is a crazy assumption cos a lot of the time these artists were really suffering for their art. But I had never thought about it, so thank you Tracy for making me think!! Haha, I love your game Tracy. Think I shall try it out later this week when I take a trip to Tate Britain in London. Bound to be a few hoity-toity know-it-alls there. You did forget to mention the intensely earnest expression one needs to adopt when scrutinising these art works and the absolute necessity of making sure to stand right in the way of anyone else’s enjoyment. You are totally right about sensory overload – two hours is probably maximum for me in one go before I only start to see and not appreciate. Far better to do it in stages. Sculpture is my thing – Henry Moore, Barbara Hepworth, – sculpture we are allowed to touch! Painting – Van Gogh, Matisse, Picasso. I love just browsing – and some of the open grad shows are worth a look – some very weird and alternative stuff going on there! Enjoy your trip to the Tate. Wish I could join you. I have a feeling we’d be whiz kids at the mind reading game! Another winner! Tracy, this is great! You’re amazing, Tracy! Thanks for another terrific post. You’re so very welcome, Marylin. I’m thrilled to hear that you’ll actually be trying out our games. I can’t take all the credit for inventing them. My husband is the playful one of the family. He’s taught me that play makes everything more enjoyable. I’ve always liked art, but now I really look forward to the fun of visiting galleries, especially with children. That’s my favorite (or favourite), too. I love putting on a sassy I-know-it-all attitude, don’t you? (I’m not by nature sassy–but sometimes it’s a fun role to play). It is fun, and it is my nature, usually I keep it under wraps but I should occasionally let out to play! I think art is supposed to be fun and exciting. But it is kind of intimidating with all those guards hanging around–makes a person feel like something scary could happen. What a fun game! My favorite artist is Matisse. I especially like Icarus – with no explanation as to why, it’s just my favorite. I never can explain “why” something or someone is my favorite. For me, it’s a heart thing. It just IS. Good point on the “why”! We came up with these for the children, to get them enthused about art. But we’ve found that we enjoy playing them with our adult family/friends, even when no children are present. Then last fall we visited Henry Moore’s home and saw works of his and Rodin’s. Absolutely spellbinding. The first work of art I really appreciated (can’t remember the artist now) I saw in an art book in the college library. I just sat and looked at it for about an hour. It was just plain beautiful. And now I don’t even remember what the piece was. I know it was post impressionist. But it awakened something in me. LOL–I hope the people around you appreciated your humor, Rod. As much as I like museums, I prefer to see the art displayed in homes instead of in galleries. The word you use, “spellbinding” is correct. Seeing art in a domestic setting is what enthralls me most. The Hill-Stead museum in Farmington, CT is like that. There’s a Monet Haystack painting that absolutely enthralls me in that setting. I’m all over the place when it comes to art. I am intrigued and drawn into Rothko’s paintings, but also like Picasso. What I like most, I realize again and again, is sculptures. They catch me all the time. I’m all over the place, too. I’m not partial to any particular era, style or country, but find in every type and place, something I like, something I dislike, and occasionally, something I can’t forget–a particular combination of color, composition, subject. Beauty almost always has something to do with it, artistic skill/genius, too. And a sense of connection, as if the artist has given me an important dream. I’m not sure whether I could choose sculpture over painting; but I also could not choose painting over sculpture. I’m also very, very attracted to textiles, especially quilts and embroidery. Tracy, I love your conversation starters. They remind me of Steve Martin’s character if his movie, “L.A. Story,” when he gave his take on one of the artworks on display. Hysterical. I agree about the sensory overload. You don’t want to overdo. When we’re in Vegas, we visit the art gallery in Bellagio’s casino. There’s typically about 2 dozen paintings, etc. on display. We take advantage of the audio tour and it does provide us with insight and background that I might not otherwise have. 2 dozen paintings is about my limit. I’d love a gallery like that. And I do like the tours and all the little notes they tack up next to art. I read all that stuff; but then, I read everything. I am among these people who are intimidated by art-afraid. I’ve never been fond of art. Nevertheless, I would like to learn more about it. Art is such a huge thing and takes so many, many forms. I’ll take a guess at what you mean by saying you’ve never been fond of art. When most people say that, I find they mean the “ART” that is traditionally studied as “ART” in colleges in the western world, and collected in museums, mostly having to do with European culture. I’m curious why you’d like to learn about something you’re not fond of. That’s interesting; but I would think that endeavor would be no fun at all. Thanks for stopping by. If I ever get to Madagascar, I’ll definitely look you up!